This is an all natural, premium bacteria and enzyme product designed to remove green water and break down algae, degrading organics, debris and sludge. Can also be used to seed biological filters. Available from 8oz to 25# Treats 1,000 gallons per oz. See our other barley straw products and other pond water treatment products. 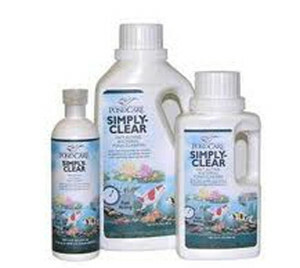 Simply Clear is a bacterial based pond clarifier that quickly clears murky, cloudy water and keeps it clean and clear through natural bacterial action. This triple action formula acts fast - clears pond water and breaks down sludge and offers a long term solution to un-clear pond water. Safe for plants, fish and animals. 1 oz treats 250 gallons; 16 oz treats 4000 gallons. See our other barley straw products and other pond water treatment products. UltraClear Instant pond clarifer produces and maintains crystal clear water overnight (usually 12-24 hours) Naturally, Safe for Fish and Plants. Treats up to 8000 gallons per 16 oz Treats up to 64,000 gallons per gallon See our other barley straw products and other pond water treatment products. Pond Care Eco-Fix is a bacterial pond clarifier that breaks down dead algae and makes pond water clean. It helps to create a cleaner ecosystem for your fish while increasing oxygen levels in the pond. Treats up to 4,000 gal per 16 oz. See our other barley straw products and other pond water treatment products. Pond Care&apos;s Accu-Clear quickly and safely clears cloudy pond water by causing tiny suspended particles of dirt and debris to clump together so they can be filtered out by your filter. 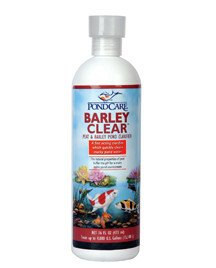 Keeps pond clean during peak summer months. Treats up to 4800 gallons per 16oz. 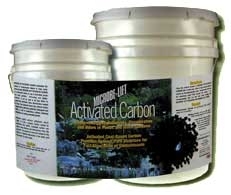 Carbon Pellets remove organic pollutants, discoloration and odors in ponds and water gardens. Activated coal-based carbon provides optimal pore structure for fast absorption of contaminants. Best when placed in a media bag. Remove when treating fish for disease or illness.